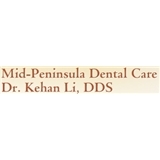 Mid-Peninsula Dental Care (San Mateo) - Book Appointment Online! In our office, quality is our top priority. We pay special attention to the details of dentistry. Our San Mateo dental practice is dedicated to providing you with the highest quality dentistry, and with personalized, gentle care. I have not seen a Dentist in 15 years, and I am 61 years young. I had a lot of build up on my teeth and was expecting some pain to get if off, and some fillings. I was amazed. I have never had a virtually pain free cleaning before after so long. Dr. Li is a true Master at what she does. She showed me all the places I needed work and I spent 5 hours in her chair getting the first of three phases down. She does not over book her patients like many Doctors. Her office is calm and relaxing and she, and her staff have the most gentle caring spirit you could ask for. I would never go anywhere else.